Video production by my friends at Candidio. Fast, inexpensive, great service. Jay: Hey, everybody. It’s Jay Baer from Convince & Convert live today with my friend, a very special guest, Simon Salt, who is a digital strategist and the CEO of IncSlingers and the author of the brand new e-book, “The Shorty Guide to Mobile Marketing”. Simon, how are you, good sir? Jay: So, tell me about this book. You made it with the Amazon publishing system, which I know people have been talking about a lot. I haven’t used it, but it sounds like it’s pretty easy. Simon: Actually, Amazon has a really, very simple converting tool. You upload the document, and it then allows you to preview what the book is going to look like in Kindle, Kindle Fire, Kindle Classic – the black and white version – Kindle Color, the Kindle app for iPad, for iPhone, and for Android. So, just in the way of what you now do with people with podcasts and video casts, and you use the right conversion tools. You can upload it to the iTunes store, and people either buy or get it for free depending on what you think your content is worth. Yeah, absolutely, Amazon, I think is definitely going that route, making it available to more publishers. I know for some people that will be an issue. Some people will not like that concept. But I think, at the end of the day, what is true in the past is still true today, is that good content carries. Jay: Well, I really enjoyed it. I thought it was worth a heck of a lot more than $4.99. I will tell you that. I thought it was a really, really good read. It’s called, “The Shorty Guide to Mobile Marketing”. Are there other Shorty Guides or did you pick that name, or is that sort of a category? How does that work? Simon: Yeah, so I picked the name. I in fact did the whole thing. I did the cover design. Simon: I bought the ISBN’s. Again, that was a very simple process. A tip, there for people if they’re looking to do that, you can buy one ISBN for $150, or you can buy 10 for $250. Simon: So, buy the 10. Jay: Yeah. Now you’re going to sell them to your friends on Twitter. That’s going to be nice. Simon: But, yeah, so that was real easy, and I am actually going to be doing a series of Shorty Guides. Jay: Great. I love the name. It’s fantastic. Jay: Yeah. It’s about what, 75 pages, something like that? Jay: Yeah. That’s a good length. We’ve been talking about that a lot, even in conversations with my publisher that the trend is toward shorter, right? People don’t have huge blocks of time. That’s one of the reasons why we try to keep these interviews under half an hour. We do our Social Pros Podcast under a half an hour. I think the book under 100 pages is really the way to go, because it’s one plane flight, right? It’s one flight, you’re done. Jay: Yep. You do a quite a bit of mobile consulting as well, and rightfully so because you’ve written, as you mentioned, other books about mobile. Is this whole sort of, “I want an app. Make me an app,” is that sort of the new version of, “Make me a website,” that used to be 10 or 12 years ago? Jay: It’s like, people want an app. They have no idea why they want an app. They just want one. What people forget about cutting edges is they’re exactly that. They’ll make you bleed if you handle them wrong. Simon: That’s the problem with it is that, “Yeah, great. We’re going to jump in here, but we have nothing to back that up. No mobile foundation whatsoever. Our website doesn’t work on mobile. You can’t buy product from us or order a service from us on a mobile device. But we’re going to have an app.” Great, it’s actually a great way to kill the mobile engagement by jumping in there first. Jay: So, you’re saying then that people should make their existing web content mobile friendly first, and then build a dedicated app second? Simon: Yeah, absolutely. What I always teach people or try to teach people is audit first, look at what you’ve currently got on the web, and then look beyond that. What is going to be most helpful for a mobile reader, because not everything you’ve got on your site is necessarily appropriate to the mobile reader? Because what I try and get across to people is, the difference between mobile and regular web is the moment of now. Simon: Mobile is right here, right now. It’s a location aware. It’s situation aware. It’s time sensitive. It’s real estate sensitive. I could be looking at this on a three-inch screen. I could be on a 10-inch screen, or anything in between. So, you’ve really got to be aware of that. Not everything you have on your website is appropriate. Jay: Yeah, nice. That’s nice. I like that approach. Jay: The problem with web is that there’s no net unit cost, right? Creating another page doesn’t cost anybody anything, and so you get this site inflation. It’s like, “Well, hell yeah. Just put it on the site.” Then you get companies, who say, “Well, we want everything to be on the homepage, too” which creates its own sort of set of challenges. When you’re doing that mobile audit – and then obviously you can very easily look in your Google Analytics or any sort of analytics package and get a handle on percentage of mobile visits – is there some sort of cut off there that you say, “You know what? If there’s X amount of mobile traffic, we really need to pay attention to this”? I almost think about it as, how we used to think about browser design, right? “Do we need a design for IE? What percentage of people is really using IE, right?” So, is there a number that you think about? Simon: I do, but it’s more about the object. So, “Okay, we’re going to go mobile, and we’re going to do mobile web, but what is your goal with that mobile website?” So, sure, right now with your tradition, you might be driving some mobile traffic already, but what do you want to do with the mobile traffic particularly? Jay: From a behavior standpoint? Simon: Yeah. So, are you trying to push some location and time sensitive coupons, for example? You really want this content when they’re shopping. So, that’s totally different to maybe browsing your entire catalog online. They’re not going to do that. Simon: Very few people are going to scroll through 300 pages of a catalog on a phone, looking for that one thing. They tend to know what it is they’re looking for, and so they want to be able to find that very quickly. Jay: Well, we’re getting to the level of mobile penetration and constant mobile companionship, where we’re going to have to start thinking about “sites” as mobile first, and then web additive. Whereas, how we’ve thought about it forever, including now is, “Here’s my site, now what parts of that site, what reductive part of the site needs to be mobile friendly?” I think we’re going to get to the point pretty quickly here, where we think about the mobile experience as the primary experience, and the web experience is just extra goodies. Simon: Absolutely. Not just mobile web, but it’s actually mobile first within digital marketing across all screens. So, it’s how do I then extend what I’m providing on mobile, or how do I use mobile to extend what I’m providing on other screens. So, that could be the best web environment, but just as likely it could be television. One of the things that I found in a recent survey that we’re just about to publish is that a large number of mobile users, one, they’re using their mobile device while they watch TV. But they’re impacted by TV ads, and it’s that, what we call, look down moment. Simon: So, the ad finishes. They look back at their mobile device, and one of their first actions is to look for that product on their mobile device. So, they’re seeing the ad, and then they buy from their mobile device. So, it’s how to extend that. We’ve seen some good examples of that with things like Shazam being used in commercials. Simon: You buy a 30-second ad commercial slot. Use Shazam and it links to a three-minute video, which costs a fraction of the 30-minute TV slot. Jay: Absolutely. Yeah, I mean, I don’t think I’m alone in that, unless I’m on a plane, the chances that I’m using an iPad without the TV on is almost never, right? Jay: It’s such a second screen experience for me.” What movie was she in before?” You look it up on IMDb. Simon: Digital marketers need to take advantage of that knowledge that that person always has a screen with them. Jay: A lot of the things that we’ve been talking about rely on audio or video, or photography in a mobile experience. Where’s your head at these days with SMS and text messaging? I kind of feel like it is the only universally… Not even universal, but nearly universal applicability. Almost everybody has a phone that can text now, certainly more so than people who have mobile web. But yet, I feel like SMS still gets kind of a bad rep because it’s not cool. It’s not a QR code or Shazam, or anything else. How do you feel about that? Simon: I’m still a huge advocate of SMS. SMS is to mobile what email is to the rest of digital marketing. People tend to ignore it, but it’s still the most prevalent and still the easiest way to get an activation. Simon: Yeah, so I would definitely compare the two, SMS and email, just in that email marketing is still the most successful way to get an activation. SMS is definitely the most successful way to get a mobile activation. Because, to your point, you can reach more people, it’s cheaper, it’s quicker, and people will understand text, and they don’t need sophisticated technology to use it. It’s very easy. The hard part with SMS is actually, one of the problems with it, is that it works on those codes. So, text “tires” to 40404 doesn’t make much sense to people because it’s not a telephone number. Now, there are some SMS marketing services that actually offer a telephone number instead. They mask that code. Simon: If you make it easier for the end user, then you’re going to remove barriers. Jay: Nice. Well, we’re not to the point yet where we’re getting a tremendous amount – and thankfully so – we’re not to the point where we’re getting a tremendous amount of commercial texts yet in this country. Simon: Yeah. It’s in the book, one of the examples I’ve used several times, a company that I think does an extremely good job of SMS marketing is Victoria’s Secret. They do a monthly push. Their signup, when you sign up for their loyalty card, the customers give their telephone number as part of it, and then they opt in to those SMS messages. So, they push coupons, they push the monthly offer, and they push when the product line changes. So, you might get a total of one text message a month from them. Jay: To sort of precede the market? Jay: Brilliant. I love it. Jay: Last question for you, we talked about apps at the beginning. Do you think that the apps that fail… I’m going to use fail as sort of lack of usage and for a metric. Do you think that most apps that fail, that they come from companies, is it because the app itself is not inherently useful, or is it that the app is poorly promoted? Simon: I would say it’s because the brand designed it for the brand’s use and not the customer’s use. So, they came at it from the perspective of, “What’s our end goal? What do we want to do? Okay, well what we want to do is, we want to get people looking in our catalogs. So, we’re going to build an app that is really just our catalog.” Okay, well I might look at that once, then I’m never going to use it again. Simon: It doesn’t do anything for me. Then, the apps that work are the ones that fit with what I want to do. So, I saw recently a clothing brand – and I was actually talking about this before somebody did it and eventually I guess somebody had the same thought as me, surprise. But this clothing brand, what they do is they text me what the weather is going to be like, and they recommend things from your closet. So it’s a closet organizing app. You take pictures of all the clothes you own, and you categorize them. It tells you what the weather is and it suggests things from your closet that you might want to wear that day. Jay: It’s that notion of marketing so good that you’d gladly pay for it. Jay: Simon, you’ve been fantastic. Thanks so much for the insights. 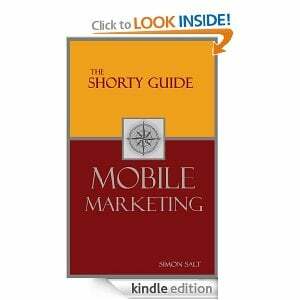 Congratulations on the new book, “The Shorty Guide to Mobile Marketing”. We’ll link it up here underneath the video and the blog post. You can get it for yourself on Amazon, just $4.99. I will see you around out there on the speaking trail one of these days. Simon: Absolutely. We’ve got to cross paths again soon. Jay: You’ve got it. Thanks a lot.